Is Kim Jong-un likely to meet Donald Trump at Korean demilitarized zone? South Korea Defense Ministry on Friday launched a task force to take steps in accordance with the recently-concluded inter-Korean summit and the Panmunjom Declaration to help in reducing tension in the Korean peninsula. ALSO READ: When Kim Jong-un visited S Korea: What does this engagement really mean? As reported by the Yonhap News Agency, the task force would comprise of officials posted at the Ministry of National Defense, Joint Chiefs of Staff along with some defence experts. The Ministry of National Defense is further planning to seek advice from an expert advisory panel. "It's a task force for making preparations for follow-up measures to implement the Panmunjom Declaration", Yonhap quoted a Ministry official as saying. 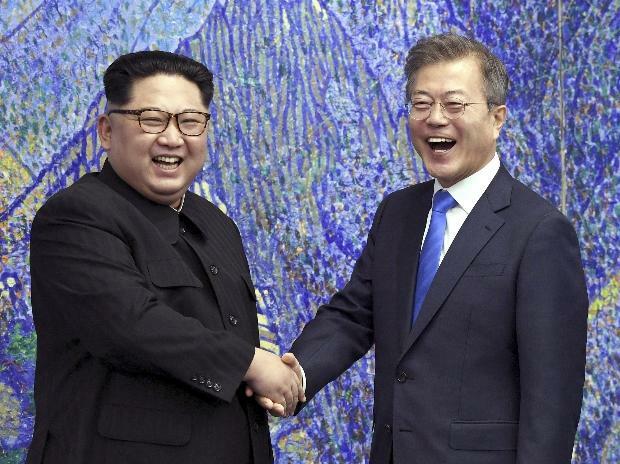 Panmunjom Declaration is the peace treaty that was signed during the inter-Korean summit held at the Demilitarized zone after a gap of 11 years. ALSO READ: Is Kim Jong-un likely to meet Donald Trump at Korean demilitarized zone? It led to an end of the six-decades-old war. Further Korean nations agreed to achieve "complete denuclearization" in the Korean peninsula. In the first concrete action, the military of two Koreas has been removing loudspeakers blaring cross-border propaganda messages from the Demilitarized Zone (DMZ). Further North-South Korea is scheduled to hold trade talks by the end of May.